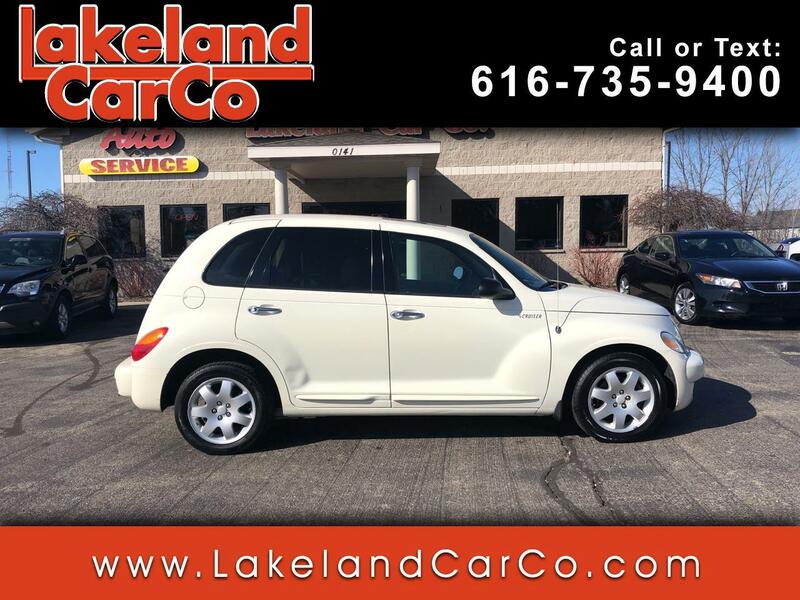 Used 2004 Chrysler PT Cruiser Touring Edition for Sale in Grand Rapids MI 49534 Lakeland Car Co.
Meet our 2004 Chrysler PT Cruiser Touring wagon in Pearl, with a retro feel and all the features you need. Powered by a 2.4 Liter 4 Cylinder that offers 180hp while paired with a 4 Speed Automatic transmission for seamless shifting. This Front Wheel Drive earns you near 29mpg on the open road while accented by sleek alloy wheels. Step into the Touring cabin and you are immediately greeted by amenities. Turn up your favorite music via CD, cassette input, or AM/FM radio. A power outlet, keyless entry, power accessories, a pass-through rear seat, security alarm, rear defrost, and more are included to make every ride a comfortable one. Our Chrysler is packed with safety features to give you peace of mind, like child safety locks, child seat anchors system, and multiple airbags. This PT Cruiser is a great choice for people of all ages and lifestyles with its whimsical, retro design and functional attitude. Print this page and call us Now... We Know You Will Enjoy Your Test Drive Towards Ownership!